KIEV, Ukraine -- Acting Ukrainian President Oleksander Turchinov told eastern regions gripped by a pro-Russian uprising that they would be courting catastrophe if they voted "yes" in a separatist referendum on Sunday. Election commission worker Vera Pozhidaeva demonstrates the readiness of a polling station for Sunday's referendum in the eastern Ukrainian city of Luhansk May 10, 2014. 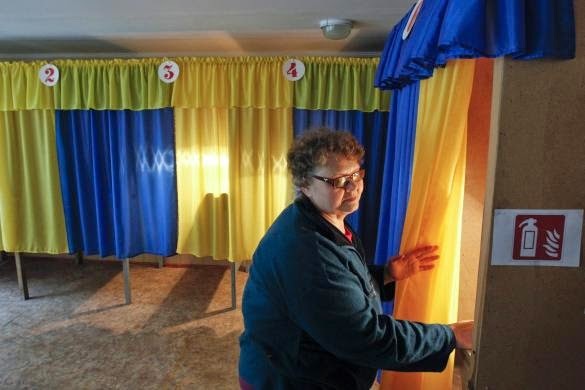 The vote, organized on an ad hoc basis with no clear control of authenticity of ballot papers or voter lists, could determine if the Western-backed Kiev government and pro-Russian eastern regions find a compromise, or whether Ukraine slides into civil war. Violence has grown along with the bitter rhetoric in the regions of Donetsk and Luhansk, where the vote will take place. " A dreadful terror is in train with the support of a large part of the local population," Turchinov said on his website on Saturday. "It is a complex problem when a population deceived by (Russian) propaganda support terrorists." The separatists say they are defending themselves against a Ukrainian government they portray as 'fascist' and anti-Russian. Ukraine, backed by the United States and the European Union, accuses Russia of destabilizing it, a charge that Moscow denies. Germany and France said they would support tougher sanctions against Russia, from energy to financial services, if the rebellion they see as engineered by Moscow thwarts Ukraine's May 25 presidential election, intended to stabilize the country. That would mark a further escalation of what is already the worst East-West crisis since the Cold War. Turchinov urged eastern regions to reject the "People's Republic of Donetsk" declared by the Russian-speaking rebels, who control a string of cities following weeks of increasingly fierce fighting. He appealed to political forces in the east to join 'round table' talks on greater autonomy. But, in reference to fighters who have seized police and government buildings, he said 'terrorists' could not be included. Secession from Ukraine "would be a step into the abyss for these regions," Turchinov said on his website. "Those who stand for self-rule do not understand that it would mean complete destruction of the economy, social programs and life in general for the majority of the population in these regions." A breakaway by Donetsk and Luhansk - the coal and steel belt which accounts for 16 percent of Ukraine's economic output - would deal a second crushing blow to Kiev. Russia annexed Ukraine's Crimea region in March, shortly after pro-Moscow Ukrainian President Viktor Yanukovich was toppled by protests. In Slaviansk, the most strongly defended redoubt of separatists, streets were blocked by barricades of tires, furniture and scrap metal. 'Everyone here is voting, and voting for the republic," said Larissa Ivanovna, who runs the cloakroom at Slaviansk's central market. Lyudmila, aged 28 and unemployed, had been waiting two hours for a bus that she wasn't sure would turn up because of the barricades. "Look at this place, everything is run-down or closed altogether. How can we support ourselves on our own?" she asked. "They need to sit down and figure out a compromise so we can live in a united Ukraine." Slaviansk's rebel mayor Vyacheslav Ponomaryov told a news conference he expected a 100 percent turnout in the election. He described Turchinov and his government as a "junta". In the port city of Mariupol, between seven and 20 people were killed on Friday when Ukrainian forces entered the port city and fought with local gunmen for control of police headquarters. On Saturday a handful of pro-Russians wearing motorcycle helmets, some carrying batons or clubs, were manning street barricades of tires, garbage containers and chairs. Smoke was still coming from the partially burnt-out administration building. Ukrainian forces remained on the outskirts of town. Video on YouTube showed an armored car captured by rebels set on fire and ammunition exploding. In the city of Donetsk, rebels released several members of the Red Cross whom they held for seven hours. One had been beaten, a Red Cross official in Kiev said. The Ukrainian crisis is making waves far beyond Ukraine's southern Black Sea shores and its northern Russian frontier. German Chancellor Angela Merkel and French President Francois Hollande said that if the May 25 election failed to go ahead, they would be "ready to take further sanctions against Russia". In a joint statement, they agreed to support tougher sanctions against Russia - affecting areas such as energy, defense, financial services and engineering - than European Union leaders outlined at a meeting in Brussels on March 6. Western leaders know sanctions can also affect their own economies. Germany, which relies on Russia for 40 percent of its natural gas supplies, has been seen as hesitant to ratchet up and broaden sanctions, which are opposed by most Germans. Stern magazine reported German growth could be cut by 0.9 percentage points this year if tougher sanctions are imposed. "Do you support the act of self-rule of the People's Republic of Donetsk?" Some people interpret it as a vote for more local powers, some for broad autonomy within Ukraine, some for independence, others still as a step towards incorporation into Russia. It was not clear on the eve of the vote quite how it would be conducted, or if pro-Kiev forces would attempt to keep any of the schools or other buildings due to host the election closed. Slaviansk mayor Ponomaryov set terms for talks with Kiev, though he is unlikely to be an acceptable negotiating partner. These conditions were the withdrawal of Ukrainian forces and an exchange of prisoners, he told a news conference. "Only after fulfillment of these conditions would we be ready for talks. If the junta continues to retain its forces here, we will continue to fight."